April 27 - 28, 2019. 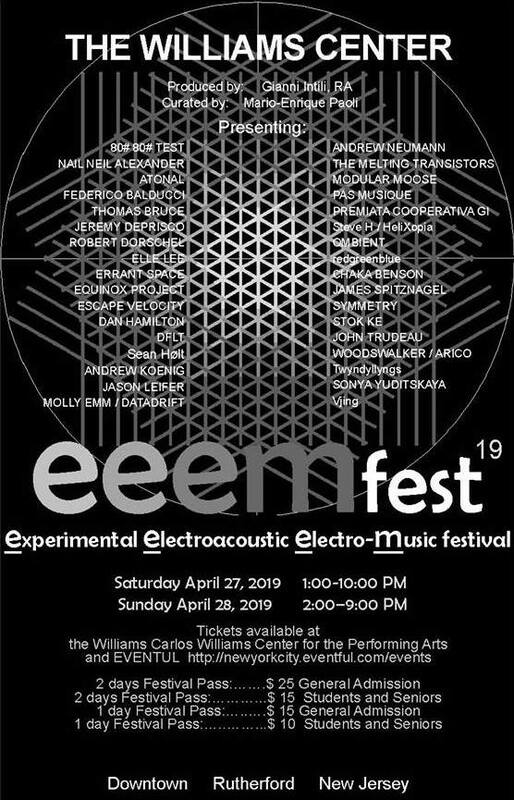 In its second year, eeemfest returns to the William Carlos Williams Center for the Arts in Rutherford, New Jersey. 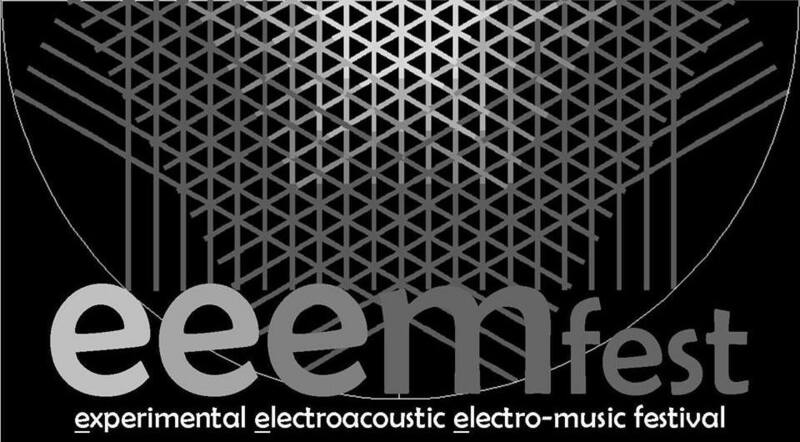 Sponsored by GI Design Studio LLC in coordination with electro-music Festivals, eeemfest is a regional electro-music event. It follows a 30-minute-per-artist performance format with an experimental avantgarde philosophy. Video artists complete the immersive artistic experience. Electro-music festivals are known as the "Woodstock of electronic music." Visit the Williams Center for information and a complete schedule of upcoming events. 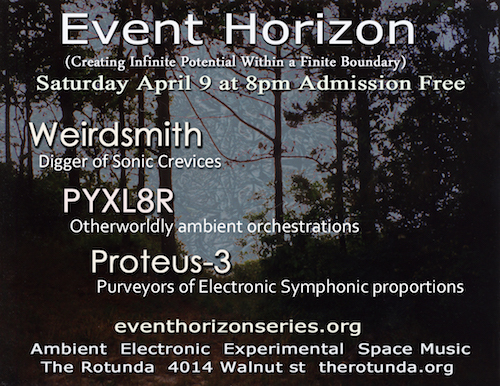 The Event Horizon series presents a mix of electronic, ambient, experimental and spacemusic. Saturday, April 27, 2019, at 8:00 pm. and the Theremin - Kip Rosser has been called one of the top ten thereminists playing in the world today. He's been called a lot of other things but we won’t go into that. Rosser's programs could be described as an electronic veggie burger with music as the buns and in between are the grilled portobello mushrooms (stories), cheese (jokes), onions (history), pickles (physics), ketchup (trance sauce), and if you want to be a vegetarian cheat: optional bacon (absurdity). He's a Moog Music endorsed artist. He's a NYC subway musician. He's composed theremin film scores. He's a teaching artist. He's won awards for his original theremin music. He's made theremin CDs. He's got free theremin lessons for you at www.kiprosser.com. He's got reviews and music videos at www.performancekr.com. He's learning to play the trombone (really!). is Steve Bowman playing electrified clarinet—a regular orchestral clarinet modified with a guitar pickup, and then processed through a chain of guitar pedals. Virtually every sound originates from the clarinet, then is pitch shifted, modulated, delayed, warped, looped, stacked, and turned upside down. No sequencers, drum machines or backing tracks. No laptop. The result is like nothing you’ve ever heard. It's electronic music driven by the expressiveness of a wind instrument. Sometimes it sounds like a clarinet. Other times you'd never guess it was anything but a full synth-driven band. The music ranges from ambient and dreamy to raucous noise. Harmonies from modal to atonal. Melodies from chromatic angularity to singing melodies. Sometimes all in the same composition. ThinAirX is electronic music with a jam-band sensibility. But unlike much electronic music performances, ThinAirX is not a free jam. Each piece is composed, with discernible structure and themes. As with jam bands or jazz, each performance is unique, capturing the energy of the moment. Steve is a veteran electronic musician, enthralled with all the fantastic sounds that modern circuitry can generate. But it's electronic music shaped by a lifetime of listening to string quartets, renaissance masses, Dufay, Bach, Beethoven, Ligeti, Subotnick, Stockhausen, Reich, Ives, Zappa, Beefheart, "more Grateful Dead shows than I can count" and a degree in Music from Harvard. Before switching to the clarinet Steve played keyboards and synths—you may have heard him perform solo as Thin Air or with Art Cohen as the duo Delicate Monster. is an electronic musician, composer, and sound artist practicing in Baltimore, MD. His work explores immateriality and its relationship to memory, systems and the virtual world. Besides his notoriety in the ambient and space music scenes for close to two decades, Jason has released over a dozen solo albums, collaborations and has been included on multiple various artist collections. In 2012 Jason began working under the moniker L'Avenir. This project explores Sloan's long time love of dark synth and minimal wave music. L'Avenir's music is created purely from analog, modular and/or vintage synthesizer equipment and has released multiple albums on Barcelona's Cold Beats Records, Germany's Eins:Zwei:Acht and Beläten in Sweden. Sloan received his BFA from Edinboro University and his MFA from Towson University. Locally, Sloan has been the recipient multiple Maryland State Arts Council's Individual Artist Awards. His installations, net.art, video art and documented performances have been exhibited internationally in cities such as Berlin, Copenhagen, Edinburgh, Kiev, Nagoya, Saint-Petersburg, Toulouse, Lisbon, Uden and Vienna. In addition to releasing over a dozen studio albums and EPs over the last decade, Sloan has played live all over the US, Canada and Europe including the influential Live Constructions radio program at Columbia University, Berlin's Liquid Sky TV, STEIM in Amsterdam, CMMAS in Morelia, and Philadelphia's The Gatherings concert series; one of the country's oldest continuing ambient and electronic music series. Sloan is a Professor teaching full-time in the Interactive Arts department in addition to being the program director of the Sound Art program at the Maryland Institute College of Art in Baltimore, Maryland. May 3 - 5, 2019. The electro-music festival is the world's premiere event for experimental electronic music. It has spawned several regional events. This regional event is near Asheville at the White Horse in Black Mountain, North Carolina. 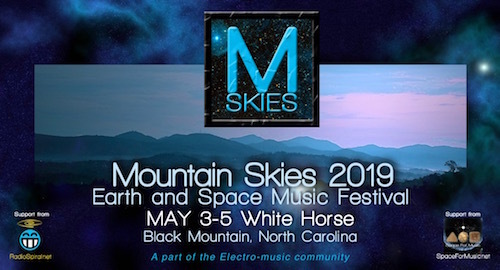 The Asheville electro-music festival is now renamed Mountain Skies and is spearheaded by Tony Gerber and Mike Metlay. Support for the festival comes from Space for Music Records, RadioSpiral, Galactic Travels™, and Thought Radio™. Electro-music festivals attract some of the world's finest electronic and experimental musicians. They will be joined by local artists for three days of electronic music bliss. Musical styles cover a broad spectrum, guaranteed to be creative and original. Live video art will accompany the concerts, for an immersive multi-media experience. The musicians employ a wide variety of electronic and acoustic instruments, from synthesizers and theremins to found objects and custom controllers. Galactic Travels™ is designed to bring WDIY listeners hour-long soundscapes of electronic, ambient, and space music. WDIY is commercial free and listener supported radio for the Greater Lehigh Valley area and the world!